Qualcomm Snapdragon 712 Vs Samsung Exynos 7904: Which SoC supports better camera, display, Storage and connectivity options? According to report, Samsung M-series Smartphone (M10, M20 and M30 models) will have Samsung Exynos 7904 Chipset which is fabricated on 14nm process. Samsung has announced this new chipsets for mid-range devices. We are also seeing some other chipset maker such as Qualcomm and MediaTek, which has released the SoC with same 14nm process. We are seeing that Exynos 7904 has more power capacity than other chipsets. On other hand, Snapdragon 712 SoC has strong camera, impressive display, storage and connectivity options which is made for upper mid-range devices. 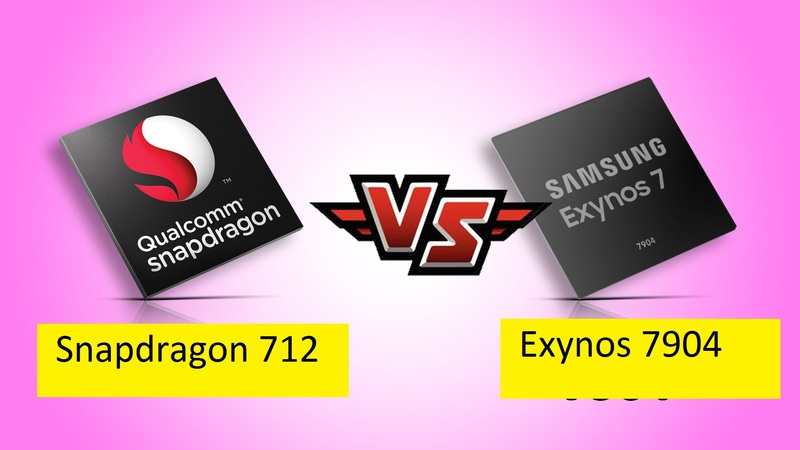 Here, we are discussing on the topic Qualcomm Snapdragon 712 Vs Samsung Exynos 7904. Which one is better SoC? RAM: Samsung Exynos 7904 chipset support LPDDR4X RAM and EMMC5.1 based storage, while Qualcomm Snapdragon 712 can support dual LPDDR4/4x RAM up to 8GB. Display: Exynos 7904 support FHD+ display with 2400 X 1080 screen resolution and aspect ratio of 20:9. We expected to see the Samsung M-series phones with taller display, while Snapdragon 712 can support FHD+ display with 2160 X 1080 of screen resolution and aspect ratio of 18:9 as well. When we talk about Exynos 7904 chipset, it is octa-core SoC of 64-bit with 14nm process. It has 2 Cortex A-73 cores for all high-end tasks clocked at 1.8GHz and 6 Cortex A-53 cores for lower-end tasks clocked at 1.6GHz. On other hand, Snapdragon 712 has 8 Kryo 260 cores clocked at 1.8GHz. 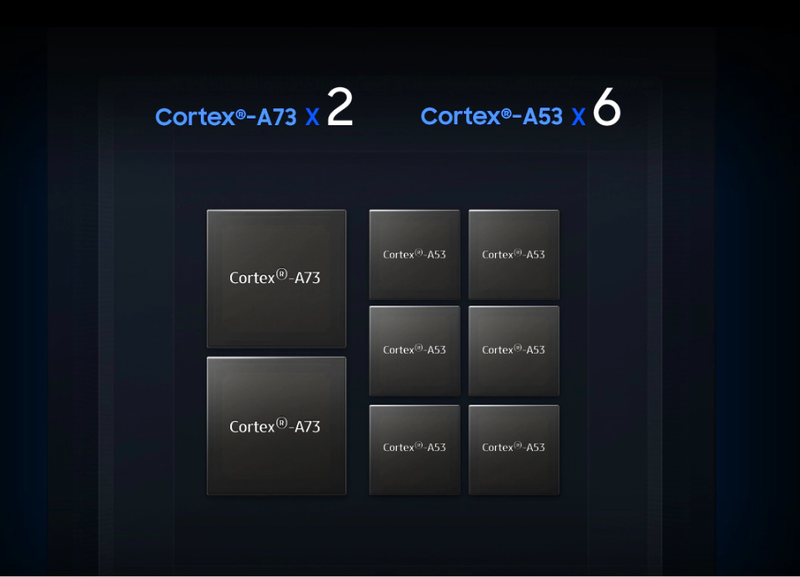 It means it has 4 Cortex A-73 cores and 4 Cortex A-53 cores. So, we can say that SD712 SoC has better CPU options than Exynos 7904 chipset because Exynos 7904 has only two Cortex A-73 cores. Samsung Company has released Exynos 7904 chipset to solve the gaming issue with Samsung phones. As we know that, heating of phones is very common issue with Samsung during gaming, its all depends on poor GPU-graphics. So, Exynos 7904 comes as solution for this problem. It has Mali-G71MP2 GPU-graphics. On other hand, Snapdragon 712 SoC has Adreno 509 GPU. At the moment, there is no phones available powered by Exynos 7904 chipset. So, we can’t judge as of now. 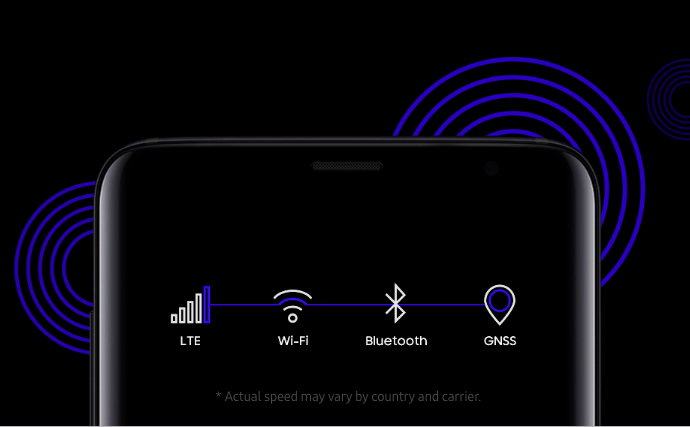 Snapdragon 712 and Exynos 7904 both has similar connectivity option like Wi-F- 802.11ac, Bluetooth 5.0, FM Radio, GPS and up to 600Mbps download speed and 150Mbps upload speed. Difference is only that, Exynos 7904 has LTE Cat-12 MODEM, while Snapdragon 712 has X12LTE MODEM. We are seeing that almost all connectivity features is same for both chipset. Qualcomm Snapdragon 712 is belongs to 700 series of chipset for upper mid-range phone, while Samsung Exynos 7904 is new chipset of the company which will be powered with Samsung M-series of phones. We are seeing that Snapdragon 712 has better CPU & GPU, display and connectivity features as compare to Exynos 7904. What do you think? Which one is better SoC? You can share your through on the comment box given below.